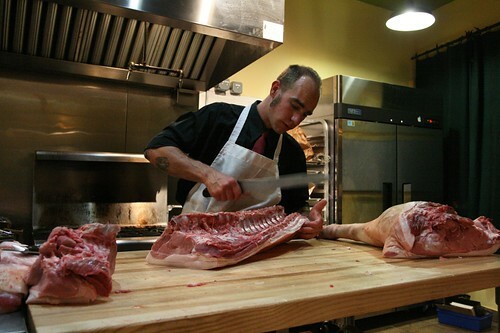 As many of you may know, my good friend Vadim Akimenko is opening an independent butcher shop in the Somerville/Cambridge area of Massachusetts. Six days ago, we started a fund raising program through Kickstarter.com and the response has been amazing. I want to thank everyone who has already contributed and put the link out there so that any interested parties know how to get involved. The funds collected through Kickstarter will help secure a location for the shop and act as some initial seed money, which will be used as a down-payment for loans and cover some expenses leading up to the opening of the shop. Akimenko Meats is also looking for some more substantial investors. The total cost of opening/building/stocking the shop is somewhere in the ballpark of $200,000, so every little bit counts. We have put together a nice list of investor rewards for people who decide to donate via Kickstarter. Check it out, or drop me a line at lickmybalsamic@gmail.com for more details or more direct contact information. Akimenko Meats strives to bridge the gap between the city dweller and our local farmers. Our commitment to our neighbors is to bring in local, organic, and sustainable products while supporting the local agricultural community, building customer awareness, ultimately aiding our local economy. Akimenko Meats will deal primarily with farms in a 250 mile radius and whole animals. To help make Akimenko Meats more sustainable we will offer house made charcuteries and stocks, making use of the whole animal. Our ultimate goal is to make local and sustainable meats available to all walks of life and year round. Akimenko Meats does not believe that eating with an ethical conscience should be a privilege that only the wealthy can afford. We want our customers to be engaged directly with our butchers, so we will not have meat in cases. This is another way to bring the customers closer to the source of their food, bring down the barriers that separate us from the customers and build personal relationship to help support the community. Our unique philosophy for customer service will set us apart from other shops in the area.